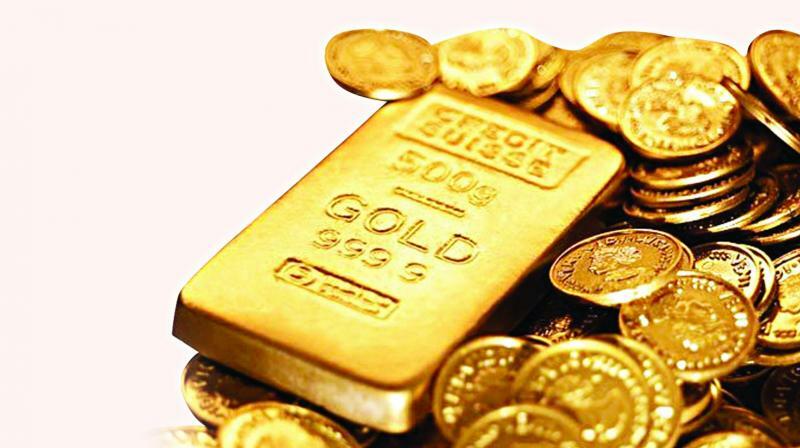 New Delhi: Gold prices on Friday declined marginally by Rs. 40 to Rs. 33,030 per 10 gram at the bullion market in the national capital due to reduced demand from local jewellers. Silver too fell by Rs. 60 to Rs. 40,450 per kg on weak demand from industrial units and coin makers. In the national capital, gold of 99.9% and 99.5% purities declined by Rs. 40 each to 233,030 and 232,880 per 10 gram, respectively. Silver-ready reduced by 260 to 240,450 per kg, while weekly-based delivery gained 266 to 239,766 per kg. Traders said lacklustre demand from local jewellers and weak global cues put pressure on prices of the yellow metal. Globally, gold held steady at USD 1,294.06 an ounce and silver stood at USD 15.74 an ounce in New York. Silver coins traded lower by Rs. 1,000 at Rs. 77,000 for buying and Rs. 78,000 for selling of 100 pieces, respectively.